Deb's Cup of Tea: Oh Darn! I was supposed to go to Iowa today to attend niece Amber's graduation from high school, Dubuque Senior High, to be exact. But, on Friday, when my mom called to explain the events of Sunday, the first thing out of her mouth when I answered the phone was, "Gad you sound awful." This is a running theme now for two weeks and it doesn't seem to be getting any better. My other niece, Christina, is pregnant with her second child and although the doctor says I'm not contagious, who really knows. I seemed to be better, except for my voice, on Saturday. But when I went to bed, I spent a good hour coughing. I simply could not lie back and get to sleep without a huge coughing fit. April has pointed out that laryngitis and the coughing I've been doing are very bad for my voice. The coughing fit sealed my decision. I called mom this morning and, although she's sad because my sister and brothers would be at the house with Amber for dinner tonight and it would be nice to have everyone in one place at one time, I'm making the best decision. It's a good 4.5 hour drive to Iowa, too. The day is simply gorgeous, beyond pleasant, and I would have loved the drive. Take the windows off the Jeep and just enjoy. I would have shown up tired and who knows what being run down could lead to, in addition to possibly giving everyone else what I still may have. Carole called last night and she's better than me, but still not 100%. Her doctor told her it was a combo of cold and allergies, but she just wonders since her, Chad and I have the same symptoms. OH DARN--Can't go to Iowa. OH DARN--Carole's still sick, too, with whatever this is. Well, it's a simply marvelous day so let's see what we can get done. I decided to tackle a long dormant project, darning socks. 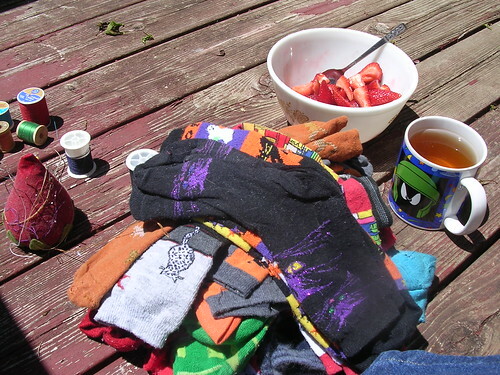 So, I amassed my socks, my thread, my scissors, my tea (Blackberry Sage) and my lunch, which consisted of cut strawberries and sat down on the deck to work. Now, dear reader, you need to know that I really don't know how to actually "darn". It was a skill my mother was always going to teach me because she darned socks all the time in the 1960's. I remember her sitting on the sofa watching Ed Sullivan with socks to darn. Essentially, I sew shut the holes in the heels and toes. These are my Chicago socks. I have socks from San Francisco and Seattle, too. My way of fixing them has held me in good stead all these years. 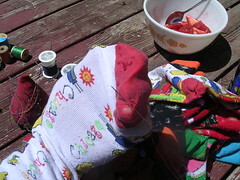 So, I sat on my deck drinking tea, eating strawberries and sewing socks. OH DARN--pseudo-darning at its best! 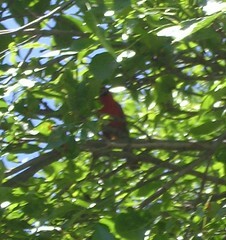 It's kind of blurry, but you try asking a mad cardinal to stand still. I think he was just yelling at Rascal because Rascal got too close to some nest somewhere. I don't know where it is and I'm certain Rascal wasn't going after any cardinals. Rabbits yes. Cardinals no. Still, it was very humorous to be sitting on the deck scratching ears and hearing the angry chirp of a male cardinal in the trees. OH DARN--mad cardinal yelling at the cat. So, now I sit updating my blog and it would appear I sunburned my legs. They are slightly pink. I'll have to lotion them up in a bit. First real outside of the spring/summer/fall season, too. Oh well. Tomorrow, I will go to the doctor and find out why I still don't have a voice and what can be done about this wracking cough. I was taking the day off anyway to come back from Iowa at a more leisurely pace. This will work out for the best. You may sound terrible, but you're so brave!